If you don’t pay attention, the Maskell bandit will steal the health of your conifers. 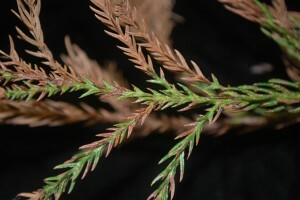 Maskell scales, Lepidosaphes pallida, will cause needle browning and branch dieback on Cryptomeria, Sciadopitys, and Pinus thunbergiana. 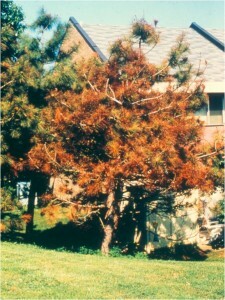 Heavy infestations can cause tree death. Maskell scale is reported to attack as many as 13 different genera of conifers, but with the exceptions of the specimens already mentioned, we’ve only ever seen it in our laboratory on Thuja. 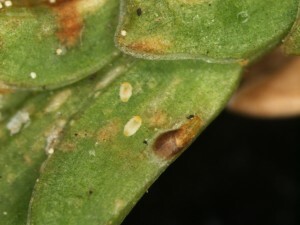 Maskell scale and the closely related pine oystershell scale, Lepidosaphes pini, are major problems for black pine in New Jersey, particularly in the southern and coastal counties. Adult scales are small (1/16th of an inch), brown, and oystershell-shaped. Crawlers (juvenile scales) are pale-yellow and appear in June and August. Maskell scales might be a little smaller, but both Maskell scales and pine oystershell scales look alike, and unless you work for the Smithsonian, they are impossible to tell apart. Light infestations are difficult to detect, so the scales are usually not noticed until populations build and plants begin to decline. Complicating things for the black pine is the fact that most of the critters hide down in the fascicles between the needles. 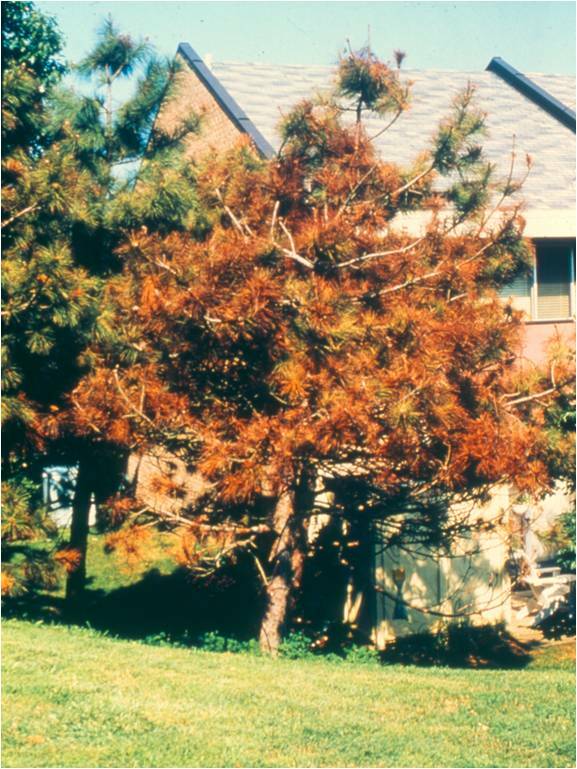 Be aware that almost every black pine sample we get from Atlantic and Ocean counties has some scale infestation. Look closely at the base of the needles to detect scale activity. Of course, prune dead and dying branches and do all you can to manage plant health with sound horticulture. 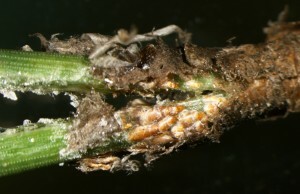 Manage light infestations with dormant treatments (March) of insecticidal oils. With heavy infestations, insecticide applications to kill the crawlers in June (1st generation) and again in August (2nd generation) are well advised to keep this bandit in check. The following materials are labeled for Maskell scale: abamectin, acephate, acetamiprid, bifenthrin, bifenthrin+imidacloprid, buprofezin, carbaryl, clothianidin, cyfluthrin, deltamethrin, dinotefuran, insecticidal oil, imidacloprid, insecticidal soap, lambda-cyhalothrin, malathion, and pyrethrins.